A large part of the issue is dedicated to Krycek, and to why he is there despite being killed back in season 8 (8X21: Existence). 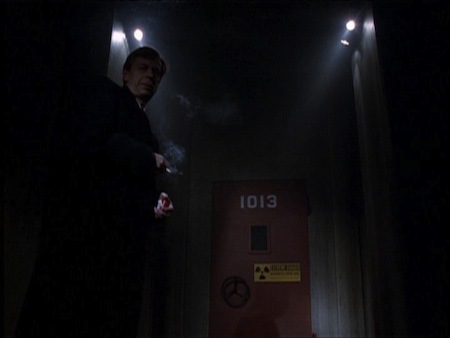 As in #13, we have flashbacks to 3X16: Apocrypha where the Black Oil that was controlling him left Krycek and rejoined the UFO, trapped in underground missile silo #1013 somewhere in North Dakota. This is when and where the aliens are taking Krycek from, as the CSM says. It would seem that Krycek is being abducted, physically taken, from the missile silo and brought to the present day. It always has been a mystery how Krycek escaped that silo anyway, resurfacing a year later with ties with the Russians and saying that he had been freed by a right-wing militia (4X09: Tunguska). 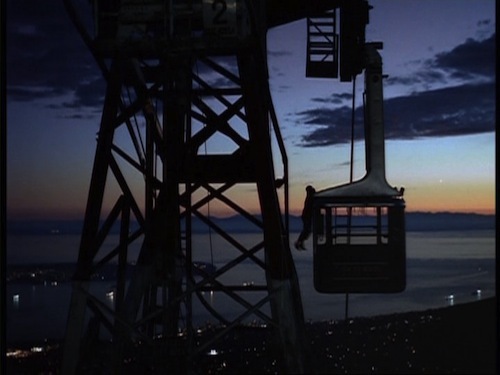 My own theory was that Krycek had been freed at the same time the UFO had activated itself with the Black Oil and managed to leave the silo somehow. However, if the Krycek we see in these issues is the abducted one from 1996, then who is the Krycek we followed during the series? Again, who is the Krycek of issues #11-12 in Saudi Arabia, who appears to be different from the one in #13-14-15? Do the aliens not only take somebody and transport him to some place else in the future but are also able to transport him back in time? It would be misplaced to assume that there’s time traveling involved here, something we haven’t seen anywhere in the past in the series (err…in the mythology at least, cf. 4X19: Synchrony!). The Krycek(s) we see could very well have been reconstructed from the Black Oil that had infected him, based on his DNA and memories that the Black Oil must have collected then, in a process similar to what the Glasses-Wearing Man is trying to perfect with his own reconstructions of X and of the CSM (the process was in the background of #8 and #10). Endless reconstructed Kryceks are possible, and that’s what happens each time Krycek fails the mission he has been assigned by the aliens (“each time you’re killed, in the future, they just grab you out of the past again“). And so this Krycek’s memories correspond to season 3’s Krycek’s. What is more puzzling is that at times he seems to remember more and more, like visiting Skinner’s in season 4 (#14), and in #15 he says “I’m here again…in the future, apparently. Slowly remembering…“. How he might be remembering anything beyond 3X16: Apocrypha is a mystery. And to complete the set of questions still left hanging after all this, what happened to the Krycek we saw in Saudi Arabia? And who was that second person in the jeep in that very first attack? (#11 page 17)? 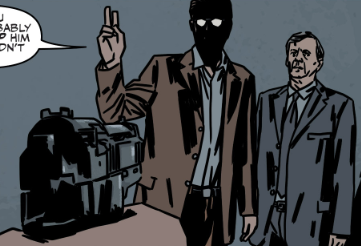 What Krycek is being sent for is “to hunt for the Forsaken Ones“, one of which is the alien Sheltem; this is encoded in his brain, something the Lone Gunmen came across in #13. Sheltem, buried underground for “millions of years“, now wants to go “home” (in a similar manner the Black Oil from 3X15: Piper Maru/3X16: Apocrypha wanted to go back to its UFO). 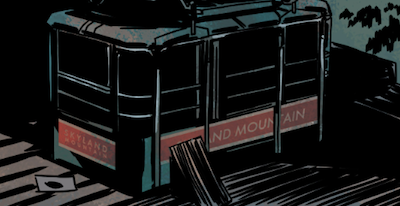 To do that, it’s travelled from Saudi Arabia all the way to Skyland Mountain, where it was expecting to be taken elsewhere, along with other Black Oil-infected people who had gathered there (some seem to recognize Cassandra Spender in the last panels of page 16, but I don’t see what she would be doing there). Sheltem says “the Cradle is full” the instant when everything is set for him to be taken; we came across this keyword sentence previously (#5, #12). 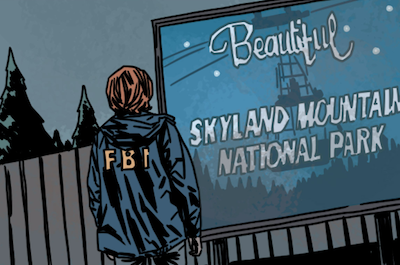 The entire setup is very similar to the one from 5X13: Patient X, where abductees had been summoned to Skyland Mountain and had met a fiery death. 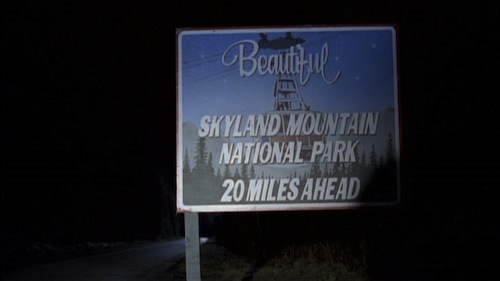 And of course Skyland Mountain is where Scully had been taken to by Duane Barry and abducted (2X06: Ascension). There are other “Forsaken Ones” out there, a strand of the Black Oil aliens that does not intend to colonize Earth but is just visiting and traveling through space. #14 suggests the “main” strand of the Black Oil is the one we know as the Colonists, or “Purity”, the one the Syndicate conspired with. Krycek was sent to hunt for the Forsaken Ones by these Colonists. But Harris had kept a big surprise for the end of this story arc, a resurrection of one of the most interesting story threads of the show that had completely disappeared after season 6 without reason! What happens then complexifies things a lot, but makes things very exciting for the future. The Forsaken Ones are surprised to find two Faceless Rebels, who burn them with their rods (we are shown a panel with the Black Oil, a notoriously resistant substance, boiling, just to make sure that it is being destroyed!). Again, echoes of 5X13 and 5X14: The Red and the Black. And alien activity accompanied by a storm, echoes of Close Encounters of the Third Kind. Then Krycek appears, a new Krycek, sent again to hunt for the Forsaken Ones after the “previous” one died or was made to commit suicide. He was outpaced by the Rebels in his task; and so now we have a free roaming Krycek out there. What just happened?! I loved how all this unfolded with nearly no dialogue at all, something rare in comics, and oh so reminiscent of similar mind-blowing scenes during the series. First, the Faceless Rebels are still out there, and who knows how powerful they have become compared to the small militia group we had last seen in 6X12: One Son. Here they exterminate the Forsaken Ones. The Rebels knew where to be, so they either got this information somehow or directed the Forsaken Ones to Skyland Mountain, just as they had directed the abductees by taking over the Black Oil’s communications and manipulating the abductees’ implants. Are they trying to destroy this type of Black Oil as well as the Colonists? Could the Rebels actually be behind it all now, having replaced the Black Oil as the main threat for colonization? Could “Forsaken Ones” in fact be the name the Rebels have for the Black Oil? Or could it be that the Glasses-Wearing Man has formed an alliance with the Rebels, and sent them to destroy the Forsaken Ones? The GWM knew where Sheltem was via Mulder, and the CSM was the GWM’s contact in the FBI. This would fit with the GWM’s line of resistance against the Black Oil Colonists (see #3 for example), but why then exterminate the Forsaken Ones if they are that different from the Colonist Black Oil? This Syndicate-Rebels alliance is a direction the show could have taken, it had even been rumored to have been in the making during season 7 but plans were scrapped. If this proves true, this is a very interesting development. And yes, “GWM” is a thing now. And so we have to add the ENTIRE SYNDICATE to the list of characters Joe Harris has brought back from the dead! This borders on the insane, but once you have the CSM why stop there? This serves very well to position the GWM as the head bad guy, he puts the CSM to shame repeatedly in this issue, and is in command of all the Elders we had come to think of as holding supreme power. 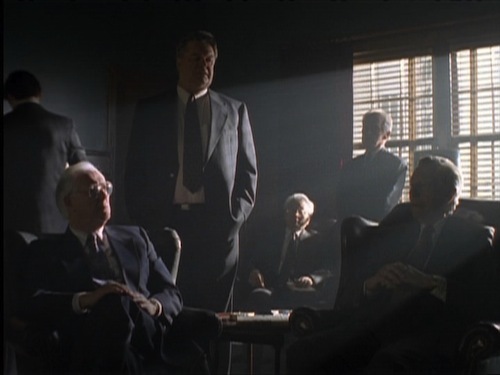 They’re all here: the First Elder, X, the Well-Manicured Man, the Cigarette-Smoking Man. As a mind-reader, the GWM has access to all their memories, and he can put each of these replicas to their old positions of power to further his interests. The NeoSyndicate is complete. We do not get a reveal of who the GWM is, despite of the very strong indications in #14 that he’s Gibson Praise. All in good time, I guess. What to make of the final scene? The CSM appears, boasting of his own power to the GWM, he is stabbed by the alien stiletto, and a new CSM appears. Did the new CSM stab the old one? Why? One could even theorize that the first CSM was a shapeshifting Rebel sent to infiltrate the new Syndicate, just like in 6X11: Two Fathers, and that the GWM understood who he was and got rid of him; but that wouldn’t fit with the GWM and the Rebels being allies (if that’s even the case). Possibly the GWM was just trying to make a point of his power over any one in this resurrected Syndicate: he can have anyone killed whenever he chooses, especially if they show their ego too much like the CSM likes to. Joe Harris is clearly in love with the mythology! More than half of this issue is spent with Krycek and the CSM and characters other than Mulder and Scully, and we don’t get any closing lines from Mulder and Scully on the whole case beyond their short exchange in page 14. More pages on them, and more pages in general, would be nice! — but that’s true with any issue. All in all, “Pilgrims” was a story arc that started on familiar ground but developed into something completely new, introducing different types of Black Oil aliens, with new twists on reappearances of characters from the past, and with implications for the future of Season 10 that make theorizing fun again! 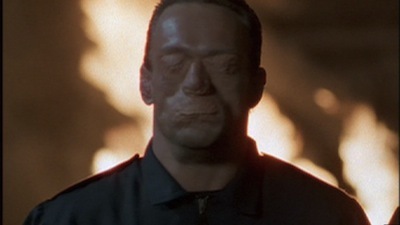 Put forward and marketed as the return of another “character” from the show, the Black Oil we see proves to be not “the” Black Oil but another entity altogether (those Forsaken Ones), so we get the impression that this story arc deals with an entity that may be inconsequential in the bigger scheme of things; Harris seems more interested in his Krycek and Syndicate shenanigans. It was also an excellent introduction for artist Matthew Dow Smith, who gets the likeness of the actors down to a T (except consistency in Scully’s hair perhaps!). As far as continuing the story, respecting what’s come before and mixing new elements, everything is in Season 10 to a remarkable degree. Now I wish there was some more space somewhere in all those pages to give the story time to breathe, spend some more time to make the ideas developed here relevant and topical to our times today (something the first issues were good at) and give us some more Mulder-Scully interaction. This entry was posted on Tuesday, September 16th, 2014 at 6:33 am	and is filed under Comics. You can follow any responses to this entry through the RSS 2.0 feed. You can leave a response, or trackback from your own site.